In Stock items will ship 1-2 days after your order is processed. Hats or hat sizes that are not currently in stock will be made to the size and specifications you have indicated on your order form. Custom orders usually take about 7-10 days to ship. Most all stock hats are made to this size. If you need a hat in a different size, this is considered a Custom Order. Prices are as stated. No additional fees are charged for making a hat in your size. Please ORDER EARLY for any important affairs or events. International Orders: All of the above applies. Ship time will vary depending on country location. All hats are shipped in a hatbox and then packed into a shipping box. Due to the nature of our business - Returns for alteration only. No Refunds. Returns for alterations must be made within 3-5 days of receipt. Please be sure to measure your head for a proper fit! 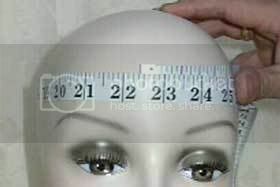 Place a soft tape measure approximately one inch above your eyebrows ( or just about the center of your forehead), wrapping the tape measure around your head keeping the tape parallel to the floor. Dont pull to tight or keep it to loose as this is how your hat will feel on your head. This is your hat size in inches. 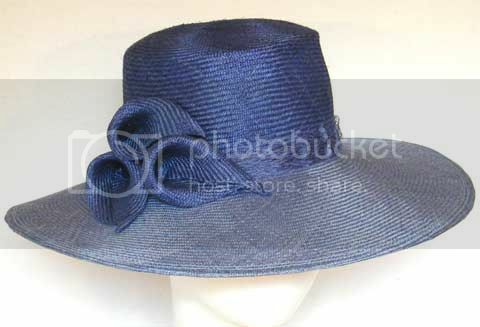 A common hat size is about 22 1/2 inches and many ladies hats are finished to this size. These guidelines will not always apply, but should be considered as a starting point for choosing a hat. The crown of the hat should be at least the same width as your face. If you have a broad face, a slender crown may not look best on you. Full-figured women may want to stick with larger hats that will suit your proportions. Petite women may want to wear smaller hats with smaller crowns and brims that will not overwhelm them. Tall women can wear all types of hats, including those with very tall crowns or wide brims. Oval: You can wear almost any kind of brim, large or small. Round:Try an asymmetrical brim to give your face a little variance. Square: Wear a hat with an asymmetrical brim and prominent crown to soften the edges. Oblong: Avoid tall, narrow shapes. Instead, wear a hat that has a horizontal silhouette. 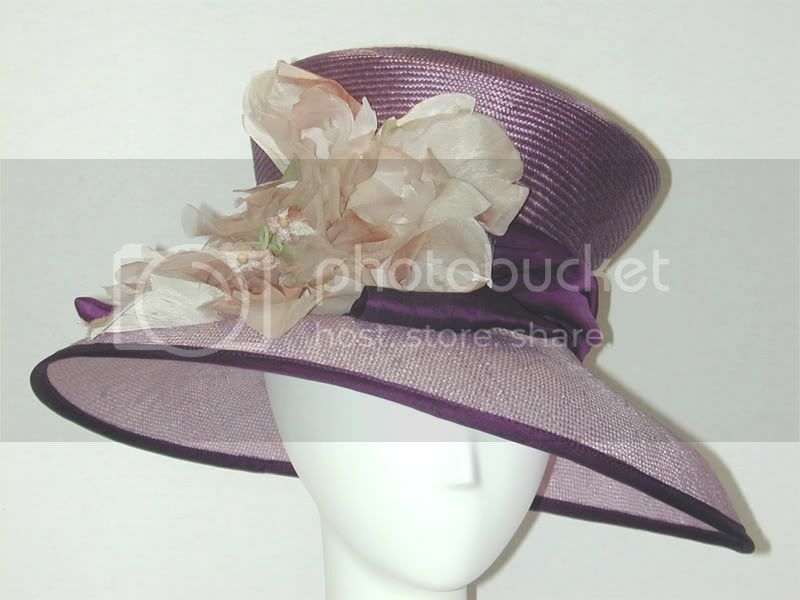 For example: One that has wide brims and crowns. Triangular: Wear hats that emphasize your eyes, not your jawline. These may include hats with up-swept or asymmetrical brims. Heart-shaped: wear hats that emphasize your eyes, not your jawline. Avoid heavy, overpowering shapes. Profile brims look good on almost all women. If you have mature skin or shadows under your eyes, wear hats that open up your face like up-swept and profile brims. Droopy brims will emphasize shadows. Fashion trends seem to break all the rules. In todays modern times there are no strict rules for wearing hats. The general guidelines are that the material of the hat should be appropriate for the season, the style of the hat should be appropriate for the occasion, and the color of the hat should co-ordinate with your selected outfit. 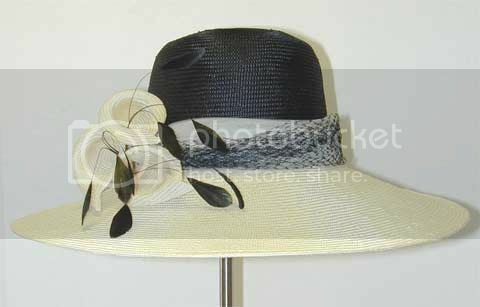 Following are some guidelines for selecting an appropriate hat shape for your outfits silhouette. Long and Full: Try large-brimmed hats first as they balance the width and length of the skirt. If the top of the outfit is very fitted and slim, you might also try an extremely small hat. Short and Full: Try brimless or small-brimmed hats first. With a large hat, you may risk looking top-heavy. Narrow: Try a small hat first. This may be a brimless hat or a hat with a small brim however, this does not mean that the hat must be small! A large-brimmed hat can achieve a more romantic look. Inverted Triangle: Try a large-brimmed hat that looks proportional to the width at the shoulders. A-line: Small and medium hats may be your best bet. PARASISAL & SISAL: Delicate in texture but resilient in wear, takes dye well. The prefix "para" means a 2x2 or herringbone weave whereas sisals are a 1x1 linen weave. These bodies are "graded" in quality from grade I to VI although we use only the higher grades I and II for our hats. The quality relates to the fineness of weave and absence of faults. FANCY SISAL: As the name implies fancy sisals are made from sisal material. The Wicker sisal is a very large hood. It is the most popular in this range. The crown is solid 1x1 weave with the brim being woven in an open "wicker" weave. They make up into a beautiful lightweight and transparent hat. PANAMA: Very cool to wear, resilient to crushing. Panama straw comes from Ecuador, however in recent years Chinese bleached palm fibre is increasingly used to emulate the original. Normally a bleached finish, however it can be dyed to pastel colors. Our Panamas are hand woven in Ecuador. PAPER PANAMA: This straw is woven from Japanese Toyo paper. Normally seen in cream or white although sometimes dyed. Made in a simple blocked shape without wire in the brim edge, this straw can be rolled and packed without damage. SINAMAY: Comes in two forms, flat sheet or cloth and loosely woven hoods. Both types need stiffening before it can be blocked. Sinamay cloth hats are generally made from a number of layers and are blocked using the same method as fabric covered hats, woven hoods are blocked using traditional blocking methods. Generally speaking the vintage materials noted on my designs are circa 1900 to 1940's. Some are earlier and typically noted as "Antique". Many modern materials pale in comparision to millinery items of yesteryear. There was a time when materials where made specifically for millinery and hat making use and the industry thrived. While there are still manufacturers that make ribbons, felts and such, it is far and few industries that make "millinery" specific materials and trimmings. Manufacturers processing were different and raw materials were often of better quality. Many of the designs found on these pages incorporate made for millinery materials of yesteryear even though I may not make a specific note of it. All the vintage materials are unused old stock sometimes found in its orginal packing or original label attached. I thrive in the excitement of the latest find and the touch and feel of these items once they arrive and feel connected to a simpler time of life when quality was more important than quantity. The same applies to the tools, hand forged of iron or wood, enginered for their specific purpose, knowing that many a hand has been part of their journey. Worthy of mention are all the wonderful people I get to meet along the way wether buying materials or designing a hat its usually an enriching experience. "The problem with the world today, There aren't enough people wearing hats." Dear Ms. Koch, The hat I ordered from you arrived today. It exceeded all my expectation! So perfect ,elegant,tastefully done,in a word: exquisite! !Thank you sooo much. My hat has arrived and I am delighted with it. The whole experience with your company has been entirely stress free and I will certainly recommend you! I wish I could tell you how much pleasure both Paxton and Laticia, my two new hats are giving me. I think I am especially in love with the Paxton. Thank you for all your cleverness and artistry and skill. I really, really appreciate your creations. Thank you, Mary Ann. The Chloe hat is gorgeous--I plan on wearing it during a bicycle "tweed ride" this spring, where men and women dress in old fashioned bicycling outfits. I ordered a Madison hat from you for my girlfriend and I just wanted to tell you the hat is utterly beautiful. Both she and I LOVE the hat. The materials and construction are of such high quality I was blown away. I had bought a hat for her from another milliner and it had turned out to be very much not the color I had requested and was priced significantly higher. The speed with which you made it was also remarkable; even though I was cutting it pretty close to Christmas, it got there with plenty of time for her to open it Christmas day.I will definitely be back. Thank you so much. Great Hat--- Hi: The Cassie fedora in winter white hat arrived and it is perfect. 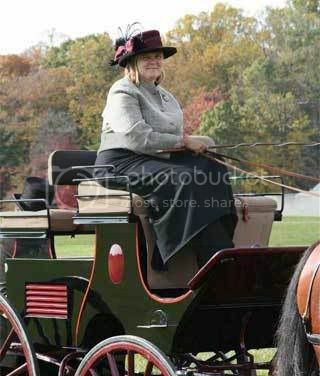 I wore it in our 4th of July parade when my carriage carried the Grand Marshall in the parade. Thanks for a superb topper. I love my Montana Ginger Hat!!! This is by far one of the best purchases I've ever made! I will be sure to pass your name around. Thank you so much and thank you for all the personaliztion you put into it. It made it even more special. The custom hats you designed for me arrived today. They are both so beautiful! The craftsmanship is amazing! Thank you so much for the love are care you put into them. I promise I will give them the greatest care. I received Megan today and boy.....!!! I LOVE HER!!! I can't wait to wear her to church on Sunday. Thanks for your patience with me as I made a major purchase, of an item that I have no real experience with, over the internet. I love the charcoal!! It was perfect!! Thanks so much!! This has been a wonderful experience and I look forward to purchasing from you again real soon!! Your hats arrived this evening. Thank you so much. They are exquisite I am so excited. The Megan in purple is a beautiful color. I love all of them and look forward to wearing them soon. Thank you once more it was a pleasure doing business with you. Dear Mary Ann, Yvette just arrived and she is so fabulous. You did it again. Your work is wonderful. I have loved hats my whole life and have purchased many however none fit and they would always leave me with those tight forehead marks, and headaches galore too. No more . . . thanks to you and your beautiful Couture Creations. Again thank you.<br>India DeClair, TX. I've received many packages in the mail, but few have been so pleasing to open as the hats I ordered from Couture Creations. They were well packaged in both the outer and inner boxes. But it was what was under the tissue paper that was best of all. 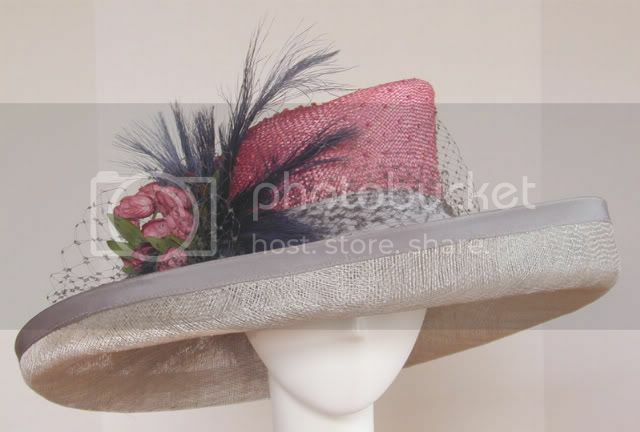 The quality of the fabric and design of each hat was stunning. These are distinct and unique pieces. Someone asked me if they were vintage pieces because she hadn't seen such properly designed cloche hats like that in ages. I would strongly recommend Couture Creations! Mary Ann spent time discussing color combinations and fabric choices. She also gave detailed and easy to follow instructions to insure the best fit. Caterina arrived yesterday, and she is beautiful. What a lovely, well-made hat! I shall wear it with pride. :) Thanks for the fine workmanship and the fast delivery. I received your hats today -- Thursday -- in excellent condition (due in no small part the care you took in packaging them) and they all fit! I even have extra head room, so maybe my head isn't as huge after all! The quality is excellent, and although all of the hats are beautiful, Hana is simply stunning, and the bows on both the black and red hats are absolutely perfect! You'll definitely hear from me in time for fall orders! The hat arrived last night and looks beautiful. You are such a talented lady! By the way, this was the first time I ever did anything like this ....surfing over the internet. You made it a great experience. Thanks. Thanks for the update. The first two are gorgeous. I haven't decided yet which will go to Ascot with me. Once again, let me say that it's a pleasure doing business with you! I received the Adriana hat and I love it. Tomorrow is my luncheon and I'm sure it will be the prettiest hat! Thanks so much. We received the headpieces today and they are lovely. Absolutely perfect. You did a wonderful job. Thank you very much. Hello, Yvette is a really beautiful hat. I'm very pleased with it. I can see the quality and the Janine style hat band is lovely. The size is also perfect. Thank you very much. I would be happy to use your website again in the future. Thanks again. Just wanted to let you know, however belatedly, that the special order hats arrived on time and in good condition. They fit the actress beautifully and she was impressed as she has only ever had one hat in her adult life that was big enough! Thanks again for rushing the order! I bought my first hat, a greenish straw with navy trim and a navy flower with a hat pin stamen, at Lilies of the Field in Doylestown. I can't tell you how many people have remarked about that hat. A woman stopped her car today to yell to me on the sidewalk that she loved it. So I went online (I live in Pittsburgh, so I don't have easy access to Doylestown) and bought another one. This one is lavender with dove grey trim. It is breathtaking. I am so glad you have a web site! Everyone loved the hat and I'm sharing the couturecreations link with anyone who asks who made my hat. It was perfect - thank you so much. I am a self trained milliner and have been making hats for 6+ yrs. I am a small shop and wear all the "hats" for my company. My goal is to provide high quality millinery using the finest of materials. The purpose of this site is to provide a boutique experience from the comfort of your home. Please ask questions! I love to hear from you. 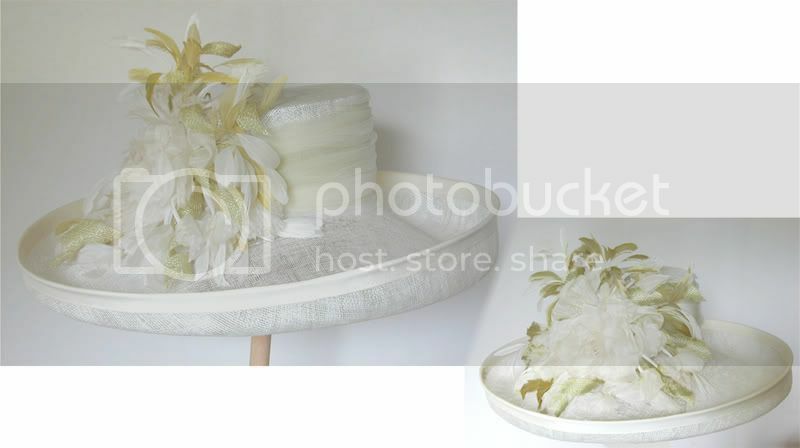 As a lover of vintage millinery I incorporate what is referred to as "Old - New Stock". This is stock that has never been used. These vintage items have been found in retired millinery warehouses, small museums and private collections across the country including the European marketplace. All hats are hand blocked and hand finished using traditional millinery techniques. 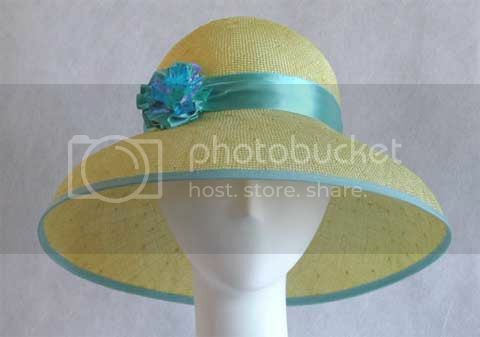 Head-size ribbon and brim edges, unless otherwise stated, are machine sewn. All trims and finishings are hand sewn, many handmade. We do not use glue! You are purchasing a first quality product. Thank you for taking time to learn about me. Here are some examples of custom work made for individual customers. The Mad Hatter Hat was created for the Bucks County Local Derby Party. A yearly event held in conjuction with the Kentucky Derby Race to benefit the James A. Michener Art Museum. Planning a non traditional wedding? The bride wanted something a little different. We adapted another one of our designs to suit her taste. 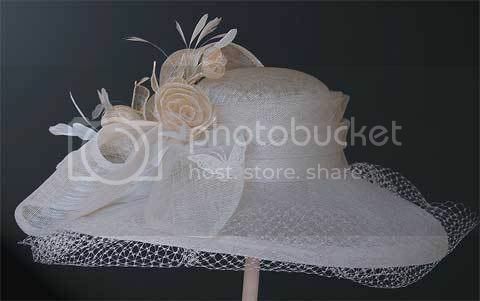 The rounded crown is covered with vintage veil and beaded trim The brim was shaped and finished with beaded trim. The Hat Ladies: This a nation-wide Organization of Ladies of all ages who combine their love of hats (of all colors) with their desire to volunteer. They represent the best of fashion and compassion and fun. IQnection - IQnection is a web design, hosting, and advertising company located in Doylestown, Pennsylvania, just north of Philadelphia. Art & Design Online: The premiere resource tool for the Art and Design Community! Our extensive database allows direct access to top of the line Artists and Designers from around the world.